Sadly, most of the men who remember that day have passed on. But their voices are immortalized in Beyond Valor: World War II’s Ranger and Airborne Veterans Reveal the Heart of Combat. For nearly twenty-five years, I’ve been interviewing American veterans from WWI to Iraq, and I have captured more than 4,000 oral histories from WWII veterans in elite units such as the Rangers. These men were my friends, men my daughter called uncle. In many cases, these great Americans did the impossible. Their individual actions changed history, and they did their duty in the face of tremendous odds. On the morning of D-Day, members of the 5th and 2nd Ranger Battalions were making their way through the choppy waters off Normandy to their D-Day objectives. They were divided into three different groups, each focused on specific military targets. Their primary focus was the guns of Pointe du Hoc and the deadly German mortars on the high ground to the extreme left of Omaha. For the bulk of the Rangers, including the 5th Battalion, their secondary objective if Pointe du Hoc failed was Omaha Beach. Faulty radar and failed radio transmissions led to a chain of events that put the 5th and several companies of the 2nd Rangers on their secondary objective: Omaha. At the right place, at exactly the right time, they led a crucial breakout. “We went up on toeholds and by digging our fingernails and bayonets into the ninety foot cliff. . . . When we got up on top we had only nine men left in my platoon,” recalled my dear friend Lt. Sid Salomon. Salomon was one of the first Rangers on the beach. C Company of the 2nd Ranger Battalion landed at 0645. 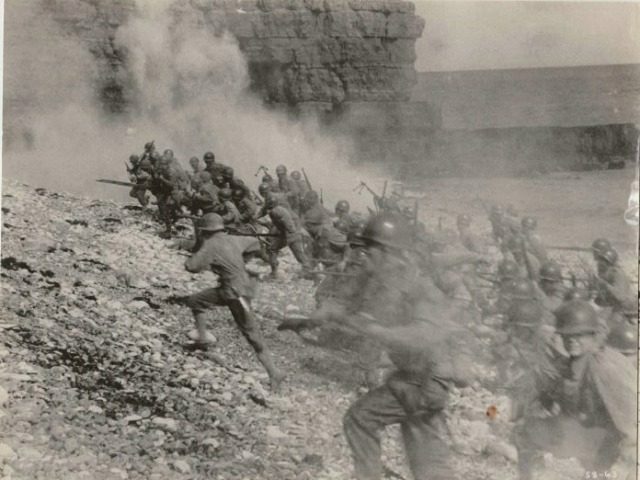 Dodging mortar and machine-gun fire, the men scaled ninety-foot cliffs of Pointe-et-Raz-de-la-Percée. 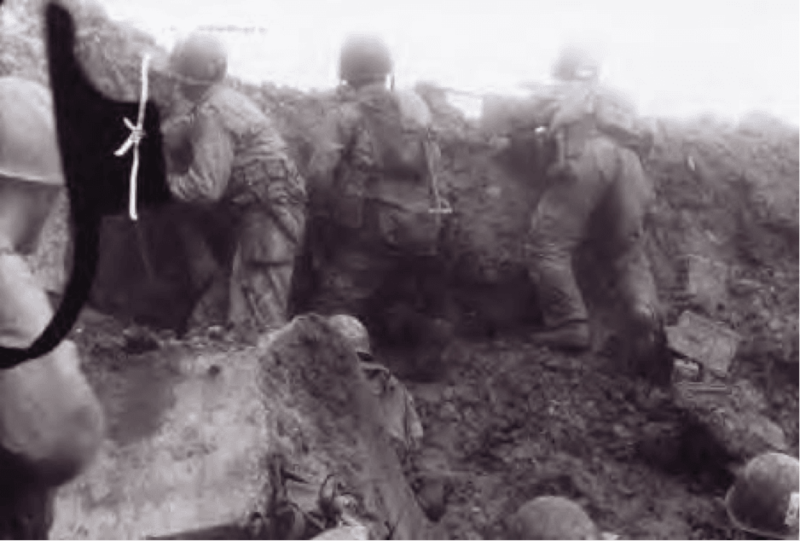 Under fire, the Rangers made it to the top and attacked the Germans in an effort to deny them crucial high ground over the Charlie sector of Omaha Beach. Then he took off running. “A mortar shell landed right behind me and killed or wounded all of my mortar section. I got some of the shrapnel—it hit my back and I landed right on my face. I fell down in the sand and thought I was dead.” Solomon remembered. But he refused to give up. “Right then and there, I said to myself that I wasn’t going to die. This was no place to be lying, so I took my maps, I got up, and ran toward the overhang of the cliff,” he recalled. But of the 37 men in the company, only nine would survive the climb. Those nine had overcome tremendous odds, but the fighting — and the dying — weren’t finished yet. Salomon and a fellow platoon leader lay in a shellhole from where they could see the German trench they next needed to assault. “We were there only a minute or two and all of a sudden Bill Moody, the 1st Platoon commander, fell over on my shoulder. He had been killed by a bullet hole through his eyes,” Salomon recalled. Without pausing to mourn, Salomon grabbed another of the Rangers who had made it to the top and said, “Let’s go!” They ran and jumped into the trench, following it until they came to a dugout. “I threw a white phosphorous grenade through the entrance and waited a minute,” Salomon explained. “We then sprayed the entrance.” With no one inside, they continued moving through the maze of trenches. That was far from the last time the Rangers would meet Germans face-to-face. The elite American forces led the way across Europe, their sacrifices ensuring that freedom and democracy would continue to thrive, as they do to this day. Patrick K. O’Donnell is a bestselling, critically acclaimed military historian and an expert on elite units. He is the author of eleven books, including seven books on D-Day and WWII. Washington’s Immortals is his newest, which has just been released as a soft cover and has been named one of the 100 Best American Revolution Books of All Time by the Journal of the American Revolution. The book is featured on the History Makers table nationwide at Barnes & Noble. O’Donnell served as a combat historian in a Marine rifle platoon during the Battle of Fallujah and speaks often on espionage, special operations, and counterinsurgency. He has provided historical consulting for DreamWorks’ award-winning miniseries Band of Brothers and for documentaries produced by the BBC, the History Channel, and Discovery. Follow him at PatrickkODonnell.com and @combathistorian.